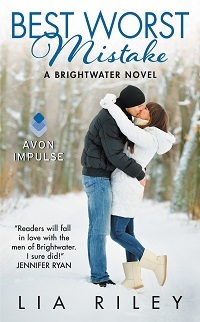 Welcome to my stop for Best Worst Mistake by Lia Riley, the third book in her contemporary romance series, Brightwater. Please read on for my review, an excerpt, check out the tour stops to see what other readers thought of the title and don’t forget to enter the tour-wide giveaway where you could win one of Five (5) Digital copies of RIGHT WRONG GUY: Brightwater #2 by Lia Riley. Lia Riley has become one of my favorite find authors this year: fun, low angst, drama only when the plot calls for it romances that are loaded with heart, humor and real people that could be your friends. I’ve read this series since the beginning, and each new book gives me that moment of “ooh”. And who can resist the titles – that oxymoronic combination of words that instantly lets readers empathize: we all have (or want) that Last First Kiss, knew the Right Wrong Guy, and have had a Best Worst Mistake. In Best Worst Mistake, we have a woman obviously addicted to her books and romances in Quinn. She’s got several tropes running through her head, and Wilder’s grumpy hermit routine seems just meant to push people away, as he protects his soft squishy underbelly. She’s intrigued and determined to see just what is beneath the smoke-screen, unafraid of his hedgehog-like prickles. These two are adorable together, a true clash of dark and light. While Wilder tends to get inside himself, holding on to a long-ago tragedy and the guilt it has created: Quinn isn’t willing to let life get her down without a fight. And there are plenty of reasons for both to have retreated, but the fact that neither has, really, is the spark that starts this story. Add to the fun banter and growing relationship with Wilder and Quinn by tossing an arsonist into Brightwater, and the story has plenty of twists and moments of danger. The lack of drama from outside forces pushing the couple apart, and Quinn’s ability to break down the multiple barriers that Wilder has placed in her path keeps the story moving forward and intriguing. While the mystery of the arsonist is secondary, the questions around the who and why last to the reveal, and keep our couple from too much navel gazing, or uncomfortable sharing moments: things move naturally from intrigue to depending on one another organically, and leaves you with a smile. After her Hollywood life went up in smoke, Quinn Higsby decided to leave Tinseltown behind and return to Brightwater to care for her ailing father. She spends her days in a small bookstore, until her peaceful existence is up-ended by a fascinating but damaged man. Quinn is determined not to be scared off by Wilder, not once she’s experienced the heat of his passions. But when an arsonist targets the community and Wilder is accused, he must confront the ghosts of his past. Will his desire for Quinn burn him up or will he be able to tame the wildness inside and rekindle a hope for their future? Would you do something for me?” She inched closer.